Growing herbs is an easy way to add edible plants to your garden for cooking and to use in soothing teas and remedies. Most herbs are versatile, and will grow right in your garden or in containers on a patio. Herbs can be annuals, biennials, or perennials, but are generally grown for one season in most parts of the country. If you are lucky enough to live in warmer climates, they will grow all year round. Herbs make a wonderful addition to any flower garden, and cooking with fresh herbs gives you truly delightful results compared to using dried spices. 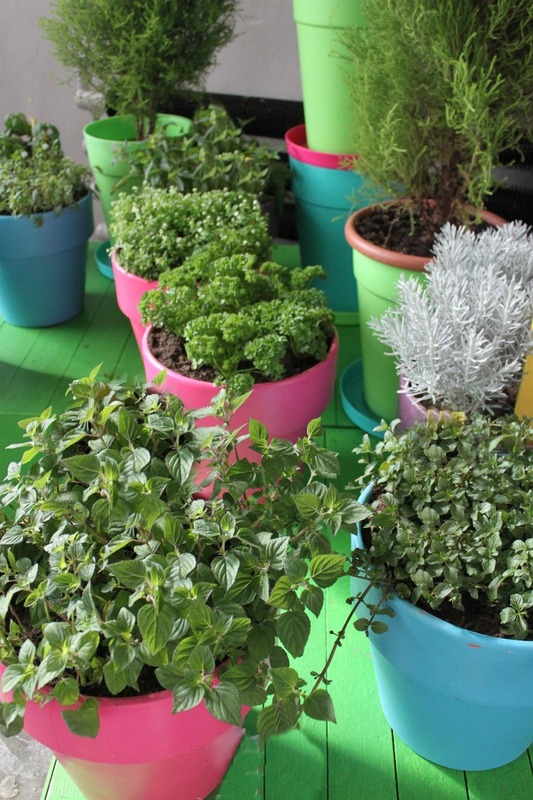 Are you unsure about growing herbs? If you like to use fresh herbs in cooking but don’t know the first thing about growing them, you have come to the right place. This page of my site links to all of the articles that I have written about identifying herbs, and also how to grow them, how to store and preserve them and, best of all, how to use them. Be sure to check thus page often. I add articles to my site about growing herbs each month, so there is always some new information on growing herbs here. The list of fresh herbs is long. Many of them come in several varieties, colors and fragrances. All add loads of flavor to your meals. Why not try one of these? Basil This aromatic annual plant is one that I use all the time. You’ll become an expert at growing basil with these easy tips. Bay Leaf – Tips for growing a Bay Laurel plant. Chervil – Grow this herb for using in French cooking. Chives – This perennial herb adds a light onion touch to foods and is best used fresh. Cilantro – Love the taste of hate it, this herb is still one of the most popular for cooking Asian and Mexican food. Dill – This biennial herb is used in many recipes from pickles to sauces and as a flavoring from fish. 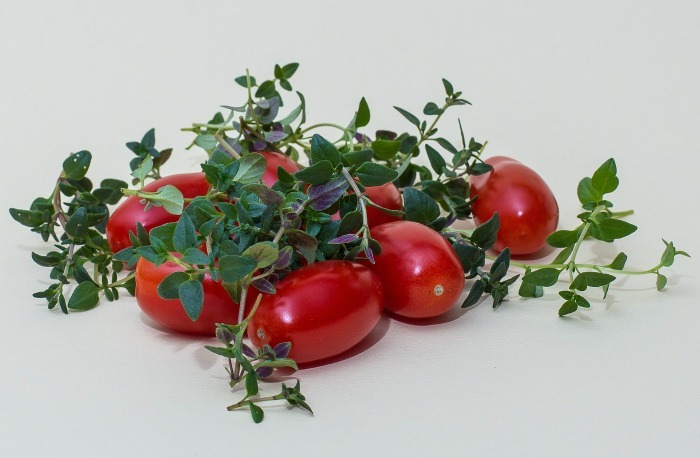 Oregano From the planter to the Italian table, growing oregano is a cook’s delight. Rosemary I love the earthy flavor of fresh rosemary. It is a great herb to use with chicken and turkey and really comes into its own around the holidays. Thyme I love the tiny leaves of thyme, since you can just strip them off and use them whole in recipes. See tips for growing thyme here..
Wheatgrass – This grass like herb grows very quickly from seeds. See tips for growing wheatgrass here. Herbs do well in the garden since they like a lot of sunlight, but if you have sunny windows, you can also grow them indoors during the colder months. Don’t know where to start? Check out my tips for growing a herb garden indoors. It’s easier than you might think! Also be sure to check out this post on herbs to grow indoors – It lists my favorite 10 Herbs for a sunny window sill as well as some growing tips for them. 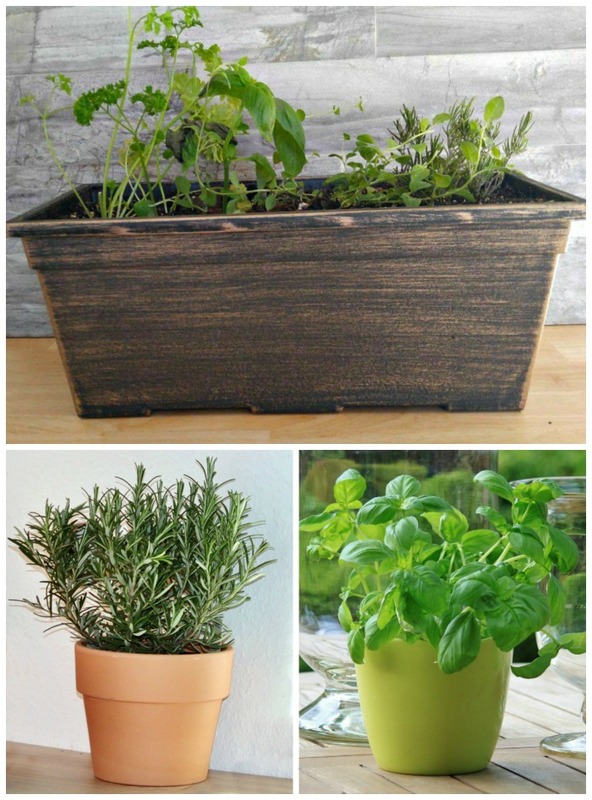 What types of Pots can you use for for fresh Herbs? All herbs can be grown planted right in the garden. You can have a dedicated area for herbs or mix them into your perennial garden. Add them to window boxes or used them in pretty containers. And the sky is the limit when it comes to growing them in pots indoors! A cute cottage chic farmer’s market tray is turned into a fun DIY mason jar herb garden project in just a few easy steps in this fun project. These delightful DIY wooden spoon herb plant markers are super easy to make and so much fun in the garden. 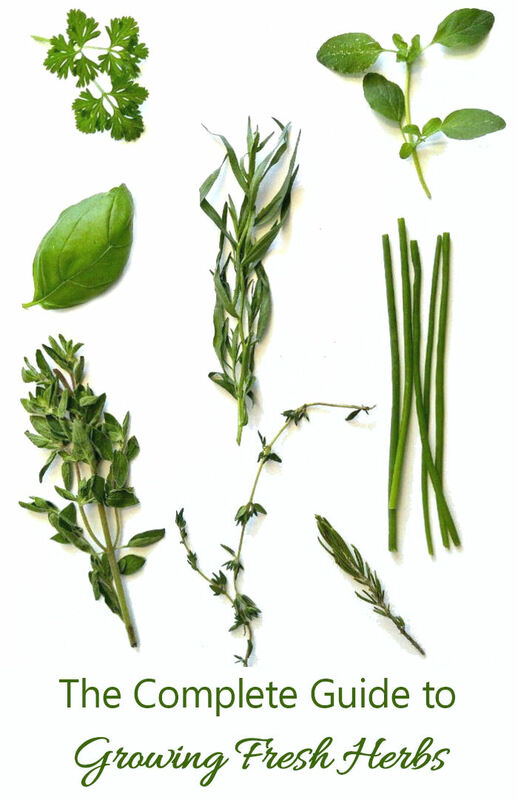 Print out these herb plant labels to help you identify your new herb garden seeds while they are starting to grow. Herbs are pretty low care compared to other plants. Give them sun light and water well and they grow easily. But there are still a few things that you need to do to keep them at their best. These maintenance and storage tips be useful. Has your rosemary plant taken over in the garden? See my tips for pruning rosemary bushes. When the cold weather sets in, these tips for preserving herbs will really come in handy. This list of perennial herbs gives names of the herbs that will grow back each year after winter. Can you recognize all the herbs by sight? Do you know whether they will love from one year or the next? These articles will help to answer your questions. Be sure to check out the larger version of the herb identification chart above. 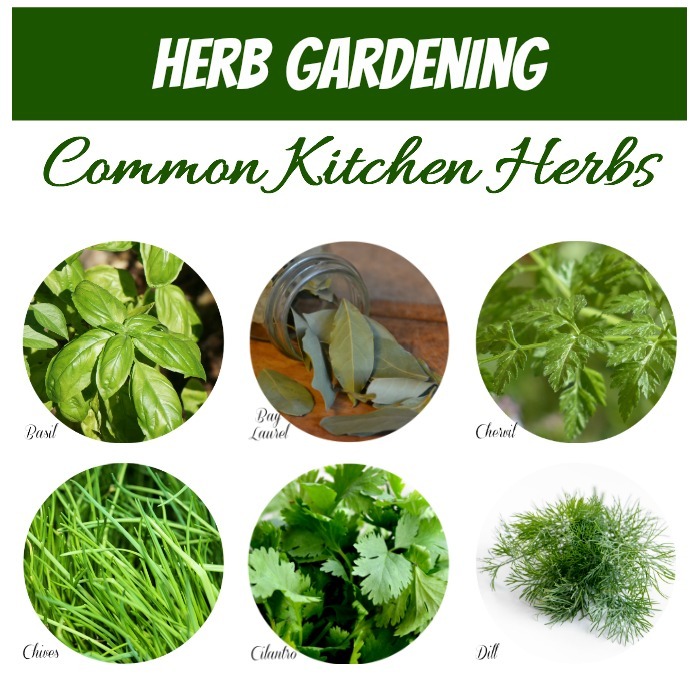 It features 18 common kitchen herbs and will be a great help in identifying them by sight. The PlantSnap mobile app is a great tool for identifying herb plants as well as many other plants and flowers. Not all herb plants die after just one season. Fresh herbs can be perennials, biennals or annuals. Find out which they are in this article. I use fresh herbs all the time in cooking. Nothing add quite as fresh a flavor as a big handful of your favorite herbs. They can be used for recipes, for soothing teas and as ingredients in oils and butters. If you are a cook, you will love my list of the 10 best herbs for kitchen gardens. Did you know that many fresh herbs are effective mosquito repelling plants?.Basil, catnip, lavender, lemon grass and many other fresh herbs make the list! Combine your fresh herbs with oil and vinegar to use in cooking. Get the recipe for Italian Herb Vinegar here. Propagating Herbs – New Herbs for Free! Just like any other plants, herbs can be propagated in a variety of ways, from seed starting to taking cuttings. These pages will help you if you are trying to increase your collection of fresh herbs by propagating them. Most fresh herbs grow very easily from seeds. 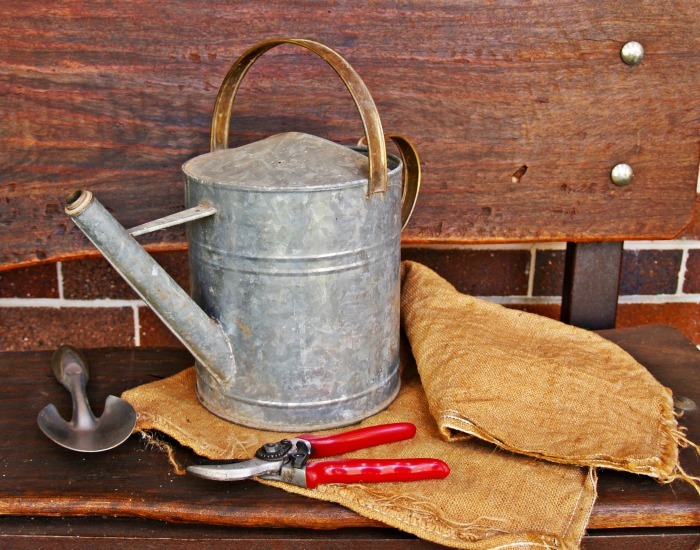 This article gives some general seed starting tips to get you going quickly. Also check out my tutorial for starting seeds in peat pellets. I chose some kitchen garden herbs to start this way. Overgrown perennial herbs can benefit from division and most herbs will grow from cuttings. Get help with these plant propagation tips. A few handy tools can make all the difference to the results that you get from your herb garden. From grow lights to the right containers and seeds, these products will be a big help getting the most out of your herb garden. 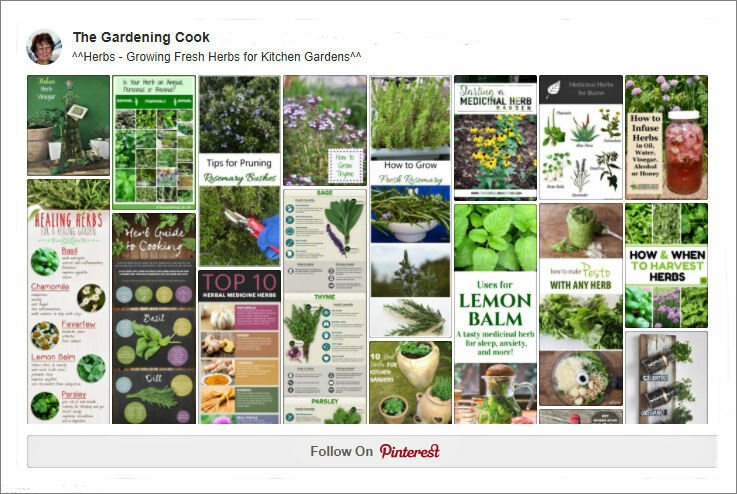 If you are looking for more information on growing herbs, be sure to check out my Pinterest Herbs Board. The board has lots of great tips and tricks as well as some very creative ideas for your herb gardens.